Damien's Ranson DeCosta tried to avoid the tackle of Iolani's Brad Nagasako during the first quarter of yesterday's game at Iolani. DeCosta had 100 yards of total offense and a touchdown as the Monarchs won their first ILH title by beating the Raiders 28-21. History has a way of repeating itself, and that was Damien's Soane Sevelo's first thought yesterday afternoon when teammate Cory Mullen separated the ball from Iolani quarterback Kiran Kepoo during a key play in the Monarchs' 28-21 win over Iolani in a Division II Interscholastic League of Honolulu showdown. "All the times I've recovered a fumble, I've always dropped on it," Sevelo said. "I saw him (Mullen) in the corner of my eye, and I knew he was going to whack him. This was my chance. I always said I was going to return one. It (the ball) bounced right in my hands this time." Sevelo's knack for getting himself to the right places on the football field paid off as he picked up Kepoo's fumble on one hop and sprinted 52 yards for a touchdown that tied the score at 14 early in the third quarter. Still later, he forced an Iolani fumble that led to the visiting Monarchs' winning score. With the win, Damien (3-5, 3-4) not only earned the ILH's first Division II title, Damien's first league title in its 39-year history, but also an automatic berth in the upcoming state Division II Tournament. "We're not done yet, I think," Damien co-head coach Rudy Alejo said. "It means a lot for our kids, our coaching staff, and the whole school. The support from the school has been unbelievable. I have to hand it to our student body. They never gave up on us, and it's a marvelous feeling." The heroes for Damien on this day were many. Running back Ranson DeCosta rushed for 62 tough yards (on 18 carries), caught two passes for 38 more, and returned a punt 39 yards after finding himself 2 yards deep in his own end zone. He even played quarterback for three plays when starter Tevita Williams (11-for-18, 73 yards, two TDs) was sidelined for a series-and-a-half and his backup, Zach Shimizu, was also forced to come out of the game. Iolani quarterback Kiran Kepoo was sacked by Damien defenders during the second half of yesterday's game at Iolani. The Monarchs won 28-21. Defensively, the Monarchs conceded yardage, but their two takeaways more than made up for any difficulty they found in defending the versatile Raider offense. 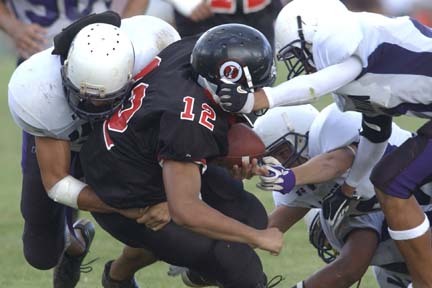 "Iolani is a big-play offense," Alejo said. "They can score from anywhere on the field. All year we've been bending, but we try not to break, and the kids did a real good job." Said Iolani coach Wendell Look: "Anytime you give up a score without your defense having a chance to play is crucial. There was still a lot of time on the clock, but it was a big play. "They (the Monarchs) did a good job of controlling the ball," he continued. "They used DeCosta well, and the two turnovers in the second half were crucial. They just played better than us, and they deserve to go (to the state tournament)." Iolani (4-6-1, 2-4-1) had answered Sevelo's fumble return with a 36-yard scoring toss from Kepoo to Lee Korenaga with 6:05 left in the third to retake the lead at 21-14, but Williams brought Damien back. Pass completions to Va'a Faualo and DeCosta, which covered 25 and 19 yards, moved the Monarchs into the red zone, and Andrew Canoy caught a 9-yard score on a corner route with 2:45 remaining in the third to tie the score at 21. On Iolani's next play from scrimmage, Sevelo caused a fumble that led to a 16-yard touchdown pass to Canoy on the last play of the third quarter for the go-ahead score. 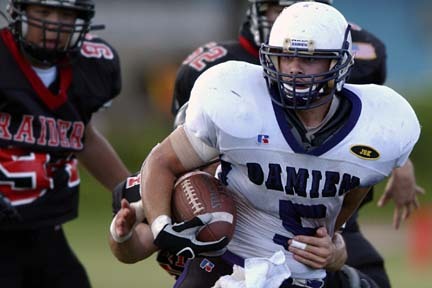 Damien opened the scoring in impressive fashion, consuming eight minutes off the clock on its first drive, which culminated in a 3-yard touchdown run by DeCosta. But the Raiders eventually took a 14-7 lead into intermission on an 8-yard run by Raynold Stowers and a 25-yard scoring toss from Kepoo to Korenaga. "We didn't play smart football in the first half," DeCosta said. "We had to come back out and cut down the mistakes and play football. We never gave up. We kept fighting." Trailing 14-7, Damien got the play it needed when Mullen (four point-after kicks) delivered his hit, allowing Sevelo to scoop up the loose ball. "We had a feeling they were going to run the ball, so we came with a safety blitz," said Alejo. "That call came from (defensive coordinator) Eric Yamane upstairs (in the press box). He called a good game. The gap just opened up for us." RUSHING -- Damien: DeCosta 17-62, Va'a Faualo 2-11, Williams 3-6. Iolani: Stowers 22-81, Kepo'o 5-16, Karl Motoyama 1-8, Mike Hirokawa 1-2. PASSING -- Damien: Williams 11-16-2-134, Zach Shimizu 0-2-0-0. Iolani: Kepo'o 16-25-1-226. RECEIVING -- Damien: Canoy 5-54, Faualo 3-41, DeCosta 2-38, Landen DelaCruz 1-1. Iolani: Stowers 5-53, Blayne Yama 4-41, Korenaga 3-67, Motoyama 3-30, Travis Nishioka 1-35. Saint Louis vs. Kamehameha, 7:30 p.m., Aloha Stadium. Radford at Aiea, 6:30 p.m.
Kapolei vs. Kalaheo at Mililani, 6:30 p.m.
Maui at King Kekaulike, 7:30 p.m.
Hawaii Prep at Konawaena, 7 p.m.
Kohala at Hilo, 7 p.m.
Shevis Shima ran in twice for touchdowns, including one for 54 yards, as Baldwin shut out Pac-Three. Baldwin's Weylin Costa carried the ball 15 times for 165 yards while quarterback Roy Antolin threw three touchdowns and totaled 130 yards on 6-of-12 completions. RUSHING -- Pac-Three: Makai'o English 11-39, Caleb Pacheco 2-13, Andrew Pacheco 2-3, Michael Bocon 5-(-3). Baldwin: Costa 15-165, Jordan Soriano 3-21, Rosa 2-10, Kaleo Aquino 4-7, Antolin 4-(-24). PASSING -- Pac-Three: English 9-20-1-55, Caleb Pacheco 2-4-1-25, Mark Miller 2-2-0-4. Baldwin: Antolin 6-12-1-130, Kalehua Moniz 1-1-0-2. RECEIVING -- Pac-Three: John Powley 6-50, C. Pacheco 3-18, Ethan Cravalho 3-15, Joel Svenson 1-1. Baldwin: Shima 2-66, Nakamura 2-21, Eno 1-30, Himalaya 1-13, Marcus Makia 1-2 . Kealakehe recorded its sixth shutout of the season to finish the BIIF regular season with an undefeated record. Jinho Tohara had touchdown runs of 45 and 8 yards for the Waveriders while Michael Kaniho ran in for another from 1 yard out. Senior Jonathan Kang intercepted Waiakea three times. Even though the Waveriders had already secured the top seed and bye in the BIIF Division I playoffs prior to last night's game, the game still had a purpose. "The win was very important," said coach Sam Papali'i. "It gives us momentim going into the championship game and the boys, particularly the seniors, needed this undefeated season." With the bye, Kealakehe awaits the winner of next week's Hilo-Waiakea match to determine the BIIF's Division I berth into the state tournament. "We still haven't done anything," said Papali'i, referring to Kealakehe's defeat in last year's BIIF title match despite being the regular-season champion. "The boys are humble and understand we haven't done anything until we win the BIIF title and get into states."